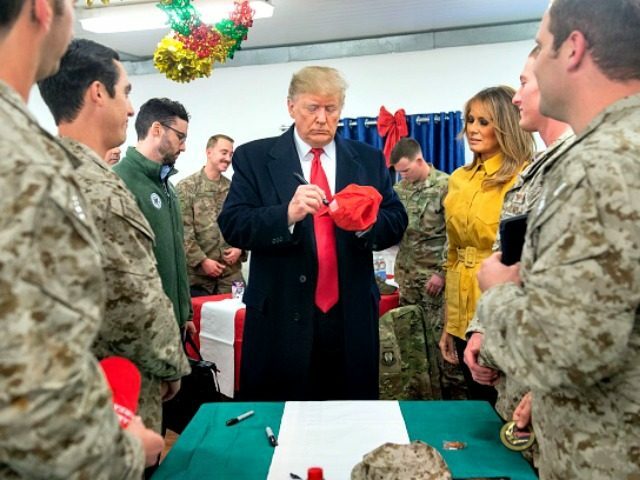 The left-wing media flipped out and then spread inaccurate accounts about President Donald Trump’s visit to troops in Iraq, where military members cheered him and asked for his autograph on their trademark Make America Great Again hats. Pictures and footage of the visit on Wednesday showed Trump signing “Make America Great Again” hats and “Trump 2020” patches for troops during his and first lady Melania Trump’s three-hour trip to greet service members in Iraq. Shortly after, former-White House ethics chief Walter Shaub took to Twitter to “shame” and condemn the president for behavior he considered “truly disgusting” at the al-Asad Air Base — a joint U.S.-Iraqi military base west of Baghdad. CNN also looked for fault with Trump and the troops, citing the same DOD guidelines and seeking comment from retired Rear Adm. John Kirby, former Obama administration spokesperson and now a CNN analyst. “It is, in fact, a campaign slogan, that is a campaign item, and it is completely inappropriate for the troops to do this,” Kirby said on CNN’s The Situation Room. Kirby also blamed Trump in his remarks. The Law and Crime website reported on former Associate White House Counsel Ian Bassin, who now heads the leftist Protect Democracy. Bassin tweeted on Wednesday that if Trump signed and handed out MAGA hats for troops, it would be a violation of the Hatch Act that prohibits federal employees from engaging in political activity in support of a candidate or campaign. There’s just one problem. The Hatch Act does not apply to the president. The President, however, is specifically excluded from those “federal employees” covered by the Act. “The term ‘federal employee’ does not include “a member of the uniformed services or an individual employed or holding office in the government of the District of Columbia,’” Law and Order noted.